Homer's Odyssey is a love story. Gwen Cooper's book is for all of us who loved Dewey, The Small-Town Library Cat Who Touched the World. It's this year's triumphant story of a cat overcoming great odds. Cooper subtitled the book, "A Fearless Feline Tale, Or How I Learned About Love and Life with a Blind Wonder Cat." It's a story of love and faith, and growing up, for Gwen and Homer. Dr. Patricia Khuly wrote the forward about the two-week-old kitten brought to her with an eye infection. She knew she couldn't save his eyes, but she was determined to find someone to love him, and that person was Gwen Cooper. At the time, Gwen lived in Miami with two other cats, Scarlett and Vashti, but the kitten's purr and attitude made her take him. And, through a number of moves and life changes, the kitten she named Homer gave her the confidence to move on. Cooper says, "Homer lives larger than life in my imagination, and I often think his story can only be thought of in epic terms." From the very first, Homer needed courage to survive. But, what Gwen found in him was also a joy in life, and an openness to whatever life would bring. When she was unsure of herself, afraid to make changes, and, even afraid to let him climb and jump to high places, he taught her to have faith and confidence in life. Cooper lost jobs, moved in with her parents, and made a career change. In all of that time, she was secure in Homer's love, and his celebration of life. And, time after time, the blind cat won over friends, her parents, and others who thought a blind cat, a cat with special needs, should have been put to sleep as a kitten. But, as much love as Gwen gave Homer, he gave her so much more. She even learned habits of tidiness so Homer could more easily find his way around. Homer is the subject of the love story, and his adventures are comic material. He's a cat who leaps five feet in the air to catch flies, an acrobatic feat even appreciated by the other cats. He was a hero who saved Gwen from a burglar, but showed her that you can't live your life in fear. His entire life was a lesson as to how Gwen should lead her own life. Homer taught her, "The world could be dangerous and bad things sometimes happened, but there was nothing you could do except live your life. And it would be foolish if, in the process of living it, you didn't also enjoy it." The author includes quotes from Homer's The Odyssey as appropriate introductions to each chapter. She stresses the importance of the lessons she learned over time from her beloved cat. Homer's Odyssey covers over twelve years in his life and Cooper's. It takes them, and the other two cats, from Miami to New York City, through 9/11, and days Gwen spent trying to get back to the cats in her apartment just blocks from the World Trade Center. It's a joyful book, with a happy ending, because Gwen Cooper learned so much from Homer. He taught her to take leaps of faith, ones that paid off in her career and her personal life. This is a love story, in so many ways. It's a beautiful story, a book that will have you laughing and crying. 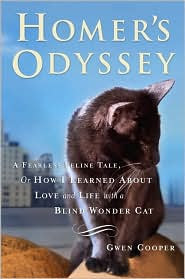 This special book is the odyssey of Gwen Cooper, a life journey she could have only taken with the help of a special blind cat. Gwen Cooper's life is successful, in large part, because of Homer's Odyssey. Homer's Odyssey by Gwen Cooper. Dell Publishing, ©2009. ISBN 9780385343855 (hardcover), 304p. I haven't read Dewey yet, but want to. This sounds light and entertaining as well. Rebecca, I have to say I enjoyed Homer's Odyssey even more than Dewey. Sorry to say that since I'm a librarian. But, Homer & Gwen are both special. My wife is a cat lover. I have targeted this book and Dewey to give to her for Christmas. Thanks for the review. You're welcome, Joe. Loved this book. Your wife will, too. Very nice Christmas present! I actually am not that fond of cats...but I loved this book. Thanks, Caite. That's nice to know that you loved this one. as you know, I adore cats - have got to get this book! I love animals and I love memoirs so this book sounds perfect for me. I can't wait to read it. I really enjoyed Dewey and I'm looking forward to reading Homer's Odyssey. I love reading about cats! This is just made for you! And, no cats die in the process. I think you'll enjoy it, Bermudaonion. I think anyone who loves animals will appreciate Homer. He's quite a cat. And, Gwen is a skillful storyteller. It sounds like it has a little bit of everything in there--action, humor, pathos. It's interesting that she included 9-11 in the book and the difficulty of returning home during those days (and what it meant to the animals there.) Thanks for sharing this one! I enjoyed "Dewey" and this one sounds like another winner. Actually, I think this one is much better than Dewey, Elizabeth. I know it's low on the bestseller list. I hope it moves up. She had moved to NYC, and lived a few blocks from the World Trade Center. It's not the most important part of the book, but it's something I had never thought about. What a wonderful review; I loved this story. By coincidence, I've just started reading Homer's Odyssey and I'm loving every word. It's wonderfully written and inspirational in a non-gooey, non-didactic way. Homer makes me want to be joyful about every day just because it's a new day. And best of all, Homer is still with us! I don't enjoy reading animal stories in which the animal dies at the end. Pet peeve of mine, if you'll excuse the expression. If you want to keep up with Homer, go to www.gwencooper.com and click on Blog. No, I'm not affiliated with the book or the author in any way, except as reader. Wonderful book, Jeanne, isn't it? I've been telling cat people, the cat doesn't die in the end! It's really such a positive book. I liked it better than Dewey. Yes, Jim told me you said you'd just finished crying over it, and that's why I told him to tell you Homer doesn't die. None of the 3 cats die in the course of this book. I'm just a sappy reader, Jen. You're going to love Homer's Odyssey. That would be funny if you all bought that book again for Christmas. Lesa, I'm having the same problem... I feel a tad guilty for liking Homer better than Dewey. I adored Dewey; bought postcards and checked on the website to follow his progress. I even have my own copy of the video, Puss in Books. One reason I was attached to Dewey is that he very closely resembled my much loved cat Max. And of course Dewey was a library cat--it doesn't get better than that! But the book just didn't have enough Dewey in it for me. I'm sorry, but I wanted to read about the cat not the town. I'm hoping the children's versions will have more Dewey. Homer is wonderful because he is the absolute center of the book. Even when the author discusses some personal problems (such as moving back in with her parents as she job hunts) Homer is a part of everything. This kind of brings up a pet peeve (excuse the expression). When another book comes out on a subject, the lines are "Forget Dewey, there's a new cat in town." Granted, we're here raving about Homer but that doesn't mean we're dumping Dewey. We can't! He's orange. And fuzzy. And orange. You're exactly right. And, my beloved first cat, Marmalade, was a gorgeous orange cat. Marmalade's tombstone says, "First Cat, Best Cat." If Marmalade hadn't been so special, we wouldn't have adopted other cats. We've had six since him (4 at a time), but he was special. Still s l o w l y reading Homer because I don't want it to end. I'm glad there has been an update at Gwen Cooper's blog to give us a Homer fix. I read the Cleveland Amory books about Polar Bear, of course, and the books about Norton (Gethers) except for the last. By coincidence, I did reviews of a couple of older kitty oriented books at the Bristol Public Library blog. One is the first Cheezeburger book and the other is The Cats' House by the Walkers. There's a tip of the hat to Lord Peter, too. Most of all, there's a photo of one of my cats, Melon. Poor Melon. He's far too good natured for his own good. As long as he gets attention, you can do almost anything to him. Hope you'll forgive the plug. If, not please just remove.